Aksa ... a long-standing partnership. Saudi Technic Energy Company (STE), a leading provider of electromechanical and instrumentation products, is looking to boost its market share, building on the reputation it enjoys as part of the well-diversified Al Arfaj Group and a rich portfolio of leading international brands. 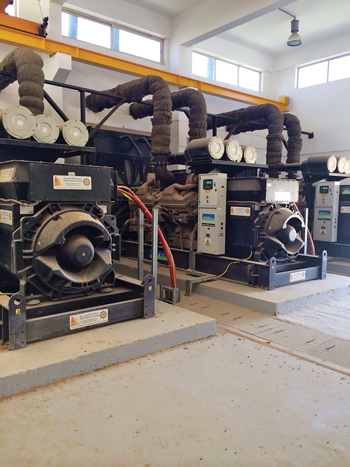 Set up in late 2006 as a division of Abdullatif Al Arfaj and Brothers Holding Company to trade in electromechanical and instrumentation products, the company ranks among the top four dealers of generators in Saudi Arabia, according to Mahmoud Al Barqi, general manager. Tracing the growth of the company, Al Barqi says: “When we were established we were trying to compete in a market where most of our rivals had a 30-year history of doing business in the market. Today, the company enjoys a 15 to 20 per cent share of the generator market, he adds. Al Barqi says one of the main strengths of the company is its “excellent” after-sales service. Saudi Technic’s activities are focused on the sale and supply of a range of equipment and materials including generators (stand-by and prime power), filters for air, oil and gas industries, uninterruptible power supply systems, dosing pumps and metering pumps for chemicals, refractory anchors and accessories, and electrical, mechanical and instrumentation systems. In addition, it provides technical services involving installation, start-up/commissioning, maintenance services, and training programmes for the equipment it supplies as well as providing technical solutions to filtration problems including installation and upgrade of the systems for air, oil and gas applications. Saudi Technic has supplied to a wide range of projects throughout the kingdom, with some 90 per cent of its business emanating from the public sector. Among its key clients are the Ministry of Electricity, Ministry of Health and the Ministry of Defence, for which it has carried out a major project in the Jazan area. It also serves a number of clients in the kingdom including Red Sea Company, Assadi Company, Al Jaza, Saad Al Rashid and (Al Amal Al Madaniyah). Its portfolio of projects include the National Information Centre in Riyadh, for which it supplied 10 2.5 MW generators; Jazan City housing project, where it supplied 35 MW and 15 MW generating units; the Abyat project in Dammam; Dammam University; a water station in Makkah, for which it provided three 2.5 MW generators; and rainwater drainage systems in Dammam and Al Khobar (2.5 MW generators). Saudi Technic holds a number of agencies in the kingdom for leading manufacturers in the UK, US and China including Dollinger International of the US and Ireland, which offers high-pressure and high-temperature liquid process filters, process and pipeline filters and systems, coalescers, breather and exhaust filters and silencers; Euro Filter (Air Filters), a UK-based manufacturer of filtration and conditioning equipment; and Hilliard Corporation, a US-based manufacturer of the Hilco oil filters and replacement cartridges, insulating oil dryers, hydraulic filter systems and acid reduction filters. It also represents Allen Filters of the US, which provides fluid filtration and conditioning systems; the US’ Neptune Chemical Pump Company, a supplier of metering pumps, mixers, tanks, panels, feeders, filter feeders and complete packaged chemical feed systems; Associated Research, a US firm offering electrical testing and measuring equipment; and Socap of Italy, which offers foldable and collapsible oil, water and chemical tanks. Al Arfaj Group, formed in 1980, has a track record of 35 years with diversified business interests. The company began operations initially in the operation and maintenance of Saudi-Qatar border and then diversified into heating, ventilation and air-conditioning (HVAC) projects in Saudi Arabia. The group has since evolved into a leading service-oriented organisation. Today, its activities cover operation and maintenance, engineering and construction, as well as distribution and service. Its member companies include Saudi Aircon, Saudi Pultrusion Industry, Saudi Technic Energy, Saudi Technic Industry, Nanotech, and MTData Middle East.